And We’re Back from the West Coast!!! We are back from the West Coast!! And what a season it was! We had a few new groups join us this year and a few new families, which made it even more exciting for me. I love to share the crazy west coast experience with newcomers and young families. It’s hard to explain to people just what to expect. At least, I can explain it, but nobody would believe the things we see and the fish we catch, unless they get to experience it themselves. This year was no exception. The fishing was fantastic and the wildlife was unbelievable. We had whales breaching and feeding around us almost daily. 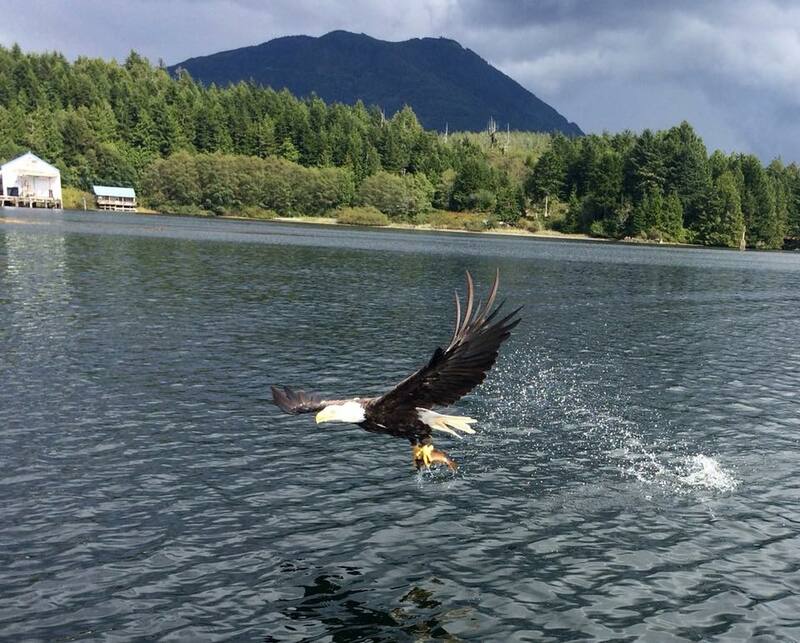 Got to feed the bald eagles almost daily. And had some non-stop action on the rods as well almost daily. July started out with a bit of foul weather. But we were lucky enough to have some fish close by and inside the islands where it was calm. And when those fish moved on, we were lucky to have the weather co-operate throughout the rest of the season to allow us to get out to where the majority of the fish were feeding. 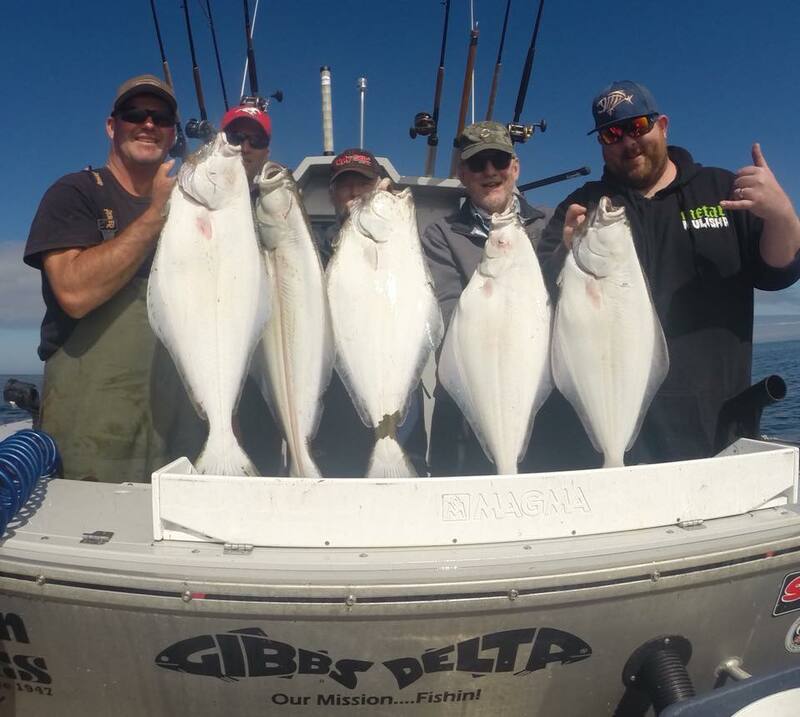 It was another banner year for our Halibut fishing as well. Most days offshore consisted of limits of salmon in the first few hours, and then some good halibut to finish our day off. It was a mixed bag of Chinook and Coho salmon this year as well. 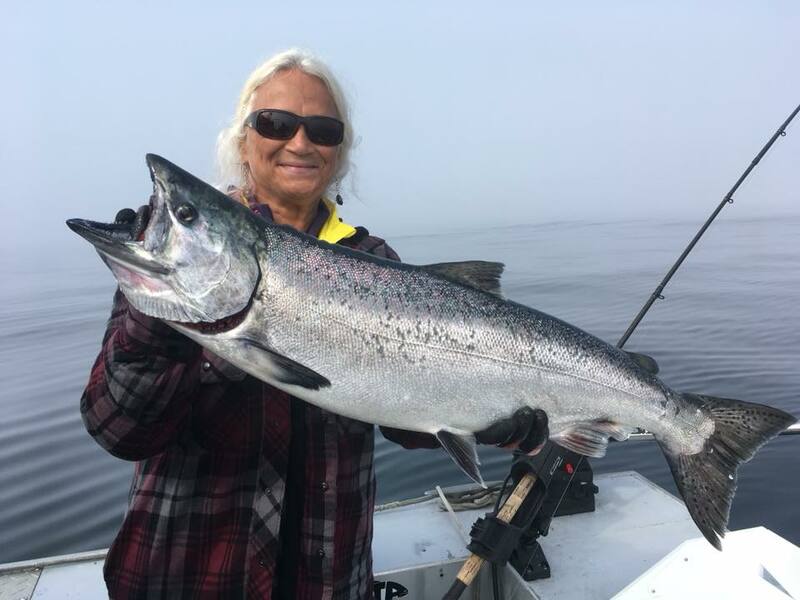 It seemed like the Chinook fishing was great, until the Coho took over. Then it was unbelievable coho fishing and we had to hunt for the quality Chinook. But thats a tough problem to have. All in all, I would consider this one of the best seasons on the coast. Consistent fishing for mostly all of our groups. I have so many memories to recall and photos to try and share with everyone, but need some time to gather my senses. Will try to sum it all up with a nice slideshow in the next little while. I’d like to thank everyone who joined me this season and look forward to seeing you again next year. It looks like most groups have decided to stay ahead of the game and already booked for next season, but I’ll be sending out reminders later in the fall/winter to others who may be interested in joining us next year. And now, back to the freshwater where our guides have been keeping the tourists happy throughout the summer. It’s been another busy tourist season for Nelson, Balfour, Kaslo. And our guides have been getting out a few times each week to share our local resource. July was pretty good fishing on the lake for both Rainbows and Bull Trout. But, as the water temps warmed up in August, the Rainbows kind of slowed down a bit. However, the Bull Trout were still eager to bite. 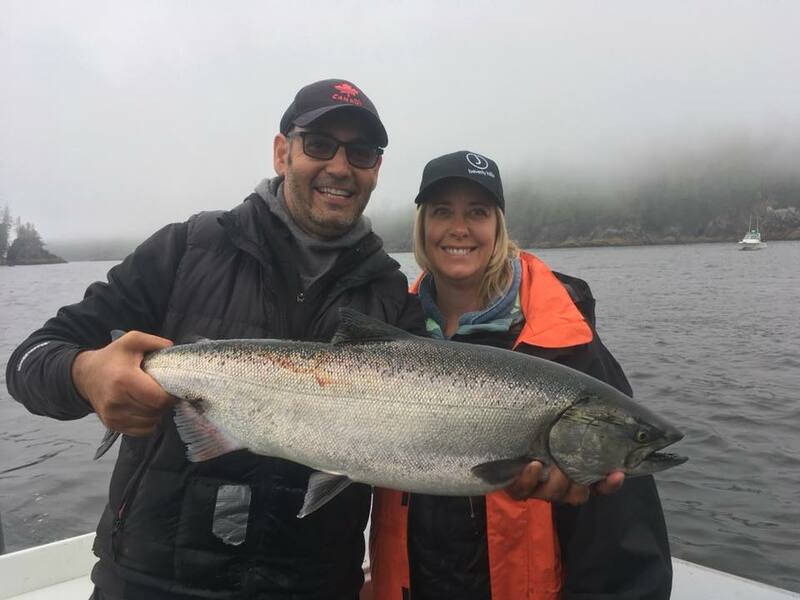 Even though the smoke was thick again this August, we still managed to get some people out on the water. Mostly early mornings to beat the heat. And most trips saw our groups hooking into 5 or 6 fish each morning. Still a great way to spend the morning. And now that September is here and the weather seams more like fall, our fishing is picking up already. The last couple weeks have been good fishing for both Rainbows and Bull Trout. The Rainbows have been caught on the surface and down deep. And the Bulls have been predominantly caught on the down riggers. Looking forward to my favourite time on the lake. October/Nov/Dec have always been a great time to fish Kootenay Lake. So, stay tuned……..
Our river trips were very successful this summer as well. July was good for both Walleye and Rainbows and either fly fishing or spin casting. And August seemed to slow down a bit for the Walleye, but they are usually quite plentiful in September and October. So, we’ll see what the next little while brings. Rainbow fishing remained consistent throughout August and so far, the beginning of September has been good as well. I look forward to the next month of fishing on the river as well. On the ocean it was a mixed bag of spoons, hoochies, and bait. My favourite Gibbs/Delta ‘cookies & cream’, maverick, and killy magee spoons worked best. And the new ‘herring aid’ was killer. And, on the lake it’s been an assortment as well. The bucktail flies have been working the past few weeks since the Rainbows are coming up. As well as small spoons and hockey sticks. Our best lures have been flies in the # 210, 215, & 226 colors. And crocodile spoons in the brass/fire wing, nickel/fire stripe, and brass/fire stripe colors have been working just as well and sometimes better. And for the Bull Trout, we’ve been catching mostly on the flasher/hoochie combo. Green Lemon Lime flasher or STS flasher with a green spatter back hoochie has been my stand by. Most consistent depths for the Bulls lately have been between 90 & 120ft. And on the River, its been a mix of fly fishing or spin casting. Most of our Walleye are being caught on jig heads with curly tails or using the bottom bouncer with a worm. And our rainbows have been caught on a mix of croc spoons on the spinning rods. And fly fishing with dry flies is still working, however we are starting to get more action on the nymphs. Looking forward to later September and October when the big October caddis appear. Stay tuned for more reports, as all our boats are back in the Kootenays! Ruth showing off her catch of the day.